History was made on Wednesday when Queen Elizabeth met and shook hands with former IRA leader - now Northern Ireland deputy minister - Martin McGuinness. Lily Murphy reflects on what this event, who many predicted would never see the light, means for the Irish nation. History was made on June 27 when queen Elizabeth met and shook hands with former IRA leader – now Northern Ireland deputy minister – Martin McGuinness. The day some said would never come actually did, and it occurred in an arts theatre in south Belfast. Although the handshake made the news, it was not the earth-shattering news story some might have predicted. Yes we have come far but perhaps we have come too far that we just do not care anymore? Does this handshake matter, in 2012, to a generation that have never witnessed or experienced the chaotic years of the northern Irish troubles? The Irish question dogged both social and political life for many decades but now that seems to have faded into the history books. The plight of the Irish economy, high unemployment and growing emigration are the top news stories in modern day Ireland. This generation knows of the northern troubles but only through the history books. It is something which is not within our immediate reach and thus does not affect us. To some, it was just the queen shaking the hand of another politician. Compromise was always going play a part in the NI peace process. Both sides had to accept it and thankfully, they did. Ian Paisley had spent his whole life bellowing those three words ‘Ulster says no!’ but he eventually compromised and sat in government at Stormont with Sinn Fein. The one time political wing of the IRA also had to compromise, joining the policing board after many years of disregarding the old RUC loyalist-backed police force. The Queen also made a compromise of her own and decided to meet the man who was described in the early 90s as the most dangerous man to Britain. A man the Queen and the rest of the British establishment would have regarded as a terrorist and someone they would never negotiate with. I even remarked upon seeing the handshake on TV that she compromised so much that she even managed to don her nicest greenest dress for the occasion! What does Margaret Thatcher think of it? What would Bobby Sands have said? Who really matters is us, our generation and all future ones who call Ireland home. It matters most to the new generation of Irish people who have not been affected by warring factions. The new Ireland has the most to make out of this handshake which is the closing chapter of a strained and too often bloody past between Britain and Ireland. If the handshake had occurred years ago then there would, without doubt, have been riots on the streets of Belfast, even Dublin and Cork, because the prospect of an IRA leader shaking hands with the commander-in-chief of the British forces who were occupying six counties of Ireland would have been seen as defeat, a sell out of republican beliefs and a disgrace to those who died for Irish freedom but with the peace process came progress. With progress came normalisation and with that came the stone-cold fact that no matter what happens – whether we stay divided or unite all 32 counties – there will still be those who wish to remain loyal subjects to the crown and most of us have accepted that. When the good Friday agreement was signed in 1998 I was only eleven. I knew it was somewhat important but I didn’t know how important it would prove to be. It was the start of the peace process, something which has in a short amount of time brought an end to violence and bloodshed on the island of Ireland. It is something which my generation have benefited most from and now the next generation will look back on the handshake and possibly say the same thing. So, yes: the handshake did matter but the northern question no longer dominates the lives of ordinary Irish citizens. When the Queen visited the republic last year she laid a wreath at the garden of remembrance in Dublin which commemorates those who died fighting against her forces. She then went on to speak a few words of Irish at Dublin castle in which she called us all ‘cairde’ which means friends. That too was a compromise but it was also a recognition that we, as a nation, have borne the brunt of many centuries of British oppression but now want to move on to better days. 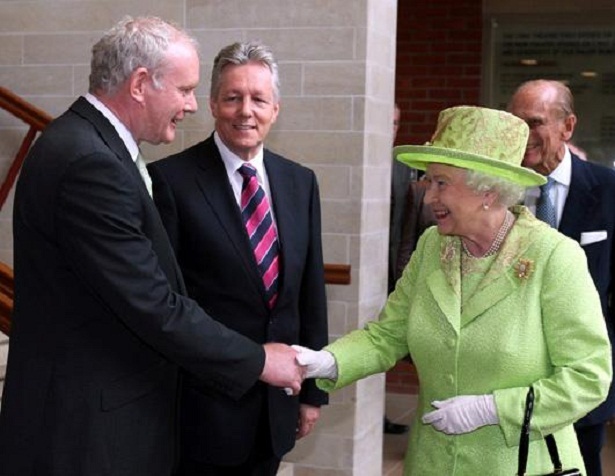 The handshake between Martin McGuinness and the queen signalled that intention. In the south, Devalera’s once dominant conservative Fianna Fail party have dwindled into obscurity while all over the island the catholic church has lost its power and respect within society. A new Ireland is emerging, one that has been damaged by years of conflict, political corruption and, more recently, economic mismanagement; but one that will learn from the past, heal through the present and look forward to better, brighter days ahead. “This generation knows of the northern troubles but only through the history books. It is something which is not within our immediate reach and thus does not affect us”. You mention you were 11 years old in 1998. So was I, except I lived in Omagh. Some people of a similar age to us are disabled for life as a direct result of the Troubles. Bomb scares, violence during band parade season, sectarian abuse, all regular occurences. So much for a generation ‘that have never witnessed or experienced the [chaos]’. Even if by ‘our generation’ you mean occupants of the Republic only I think it’s naive to think that those occurences have had no effect – especially for those on the border counties or those with family in the North. That’s from 2011, the same year a PSNI officer was killed by a bomb outside his house and who can forget the Massareene barracks shootings in 2009? Well- you apparently – but I sincerely hope that not all of ‘our’ generation has a selective memory when it comes to current affairs in the North. The violence has been stemmed, the country is no longer at full scale civil war but sadly it has not ended fully and it’s factually inaccurate to say so. Regarding the reaction to the handshake – it will be interesting to see the results of the next elections in the North. There was a huge backlash to the UUP and the SDLP in the elections in 2003. It seemed that the concessions made following the GFA had been too much for the majority of the electorate. The more central parties fell and with the parties perceived as being more hardline – DUP and Sinn Fein made massive gains. The electorate’s reaction to ‘the handshake’ remains to be seen.